A new year has begun which always has me thinking toward the future. Let me start by saying this – I am so glad 2017 is over, and I never want to experience another year like it. Period. That being said, I always feel hopeful and excited for each new year and fresh start that comes my way. While I’m not much of one to come up with New Year’s Resolutions, I do like to work towards certain things each year. 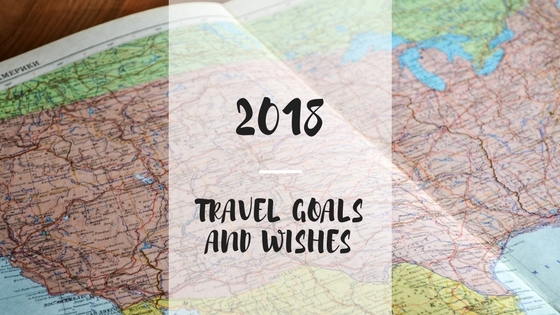 In terms of traveling, there are always certain places we hope to go and things to see each year. 1) Woking is one of the things that allows us to travel! And, I’m grateful to work for an employer (now permanently) which provides what I consider to be ample time off. 2) New jobs sometimes mean changes in things like requesting time off work. Although I’m not concerned about this, I still need to figure out how this works in my new position. Also, because I was facing unemployment and/or a potential job change, we also needed to wait and see what was going to happen with this before we could do too much planning. 1) Return to Europe. We’re pretty open on this, we just really hope we make it back here this year and explore many new places. 2) Potentially travel to Phoenix, Arizona to attend my graduation ceremony. Yes, this year I will receive my Master of Sustainable Tourism degree! It seems like just yesterday I was applying to grad school and now I am coming up on graduation. How did that happen? 3) Celebrate our 5 year wedding anniversary with a really big, really special trip We celebrate every anniversary with a trip, but we’re hoping to make this one is really special. 4) I would love to go to either Glacier National Park or a few of the National Parks in Southern Utah. Both of these locations are within about a 10 hour drive of where we live, but we’ve never been to either. We also have some interest in Banff. 5) If we decide to go on a cruise this year, I would really like to try one of Royal Caribbean’s new ships! As with most years, we are usually pretty open to whatever travel opportunities come our way. And, other than a few trips we have already planned early in the new year, we do not have much on the horizon yet. I like this, because it keeps us open to last minute adventures. Whatever we end up doing, I’m excited and grateful we have the opportunity to get out there! I’ve also starting thinking about some blog goals for the year. There is so much to learn about and do in the world of blogging! I hope to continue to put out some great destination specific content, grow social media sites, affiliates and more! I plan to continue to network with bloggers and share their great work along the way. If you haven’t followed me yet, be sure to find me on Facebook, Pinterest, and Twitter! Thank you so much!! I’ve heard Glacier just amazing! When we finally make it up that way, I’ll be sure to pick your brain for info and ideas!! Thank you! I hope we get up that way too, but time will tell where we end up going this year! Have a great 2018! Congratulations on the job too! We are planning to see more of Australia this year. Where in Europe do you think you will go? Can’t wait to hear more about your Australian adventures Tracy!! Thank you – it will make a big difference in our ability to continue traveling. Best wishes to you in the new year! Sounds like all very do-able goals for 2018. It’s great that you work in a field that allows a lot of travel! Oh so many blog goals! Grown social media, get some affiliates up and running, and learn, learn, learn! It’s no fun being unemployed and its no fun when you’ve got so much free time to explore but no funds to do so. Congratulations on the new job that will bring new adventures. Here’s to a great 2018! Thanks for all the support over the last year! I’m sure 2018 will bring great things your way as well!! Some great plans for 2018 – Glacier National Park is high on my list. I look forward to reading about your experiences there! No plans for me so far other than hopefully do a big trip at some point this year! I’m sure you’ll make it someplace great this year! If we make it to Glacier, we’ll be sure to let you know!